The Planning Division's Fee Schedule, general application form, and project-specific applications and processes information may be found below. Please consult with a Planner to determine which forms may be required for your project. Some PDF files may not display properly when viewed in a browser window; please download the file before printing. Some of the applications require separate fee payments to the City Engineering Division and the El Dorado County Fire Protection District in order to be processed. You may contact the Engineering Division at (530) 642-5250 or County Fire at (530) 644-9630 for more information. An appointment must be arranged for the submittal of all project applications. 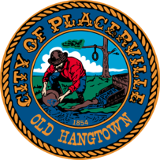 Please call (530) 642-5252 to request an appointment with the City Planner. © 2016 - City of Placerville, California - All Rights Reserved.